Featured Writer: Stephen Lloyd Webber | The Writers' Project | Exaclair, Inc.
Exaclair is honored to feature authors from around the world who are willing to share the secrets of their success; including tips and techniques for aspiring writers, and a behind-the-scenes look at their life and latest work. 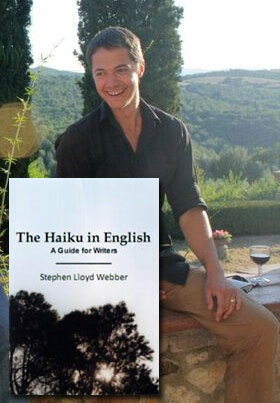 Stephen Lloyd Webber coordinates wellness and writing retreats in Italy and teaches English at New Mexico State University in Las Cruces, where he earned his MFA in poetry. His poems, short fiction, and essays have been published in numerous literary journals, including Harpur Palate, Yellow Medicine Review, Free Verse and Black Magnolias. He is also the founding editor of Di Mezzo Il Mare. Please introduce yourself—where are you from, where do you live, and how did you get started as a writer? I’m from Oklahoma. I was raised by my mother, Judy, and I have an older brother, David. One of the first books I remember loving to read was a small Gideon Bible that contained the New Testament, plus Psalms and Proverbs. Proverbs was my favorite. The poetry I am most drawn to verges on the sacred. Right now I’m reading The Second Book of the Tao, translated by Stephen Mitchell. I have a deep appreciation of the haiku tradition. Walt Whitman is one of my favorites. His first edition Leaves of Grass is beautiful. Getting started as a writer is something that happens anew each day, and this type of writing compels me forward. I was raised to believe in the imagination, and I think that’s so crucial. When I didn’t think I was going to grow up to be Superman or Batman or a fighter jet, I figured I would be a writer. What I was writing when I was young wasn’t what I would have considered to be poetry, because I think I wasn’t exposed to the idea of non-rhyming poetry being something that was done. I would write in little notebooks and on small scraps of paper. Sometimes it was drawing as much as it was writing. The idea of poetry divorced from rhyming verse was new to me, as it still is for many people. The ancient Greek word poeisis, where our word poetry comes from, simply means “to make.” That definition is freeing. What inspired you to found your writing and wellness retreats? And why Italy? Did you have a connection to the country beforehand? Several years ago, just after graduating with my BA in English from Oklahoma State University, I took a landscape painting course with Marty Avrett. Marty was a big influence on me then and he still is today. His class was held at Spannocchia in Tuscany, the same place where Jade and I got married last May and where the Writing Immersion retreat is now held. (Marty performed the marriage ceremony, in fact.) Spannocchia is a special place—it has been a model for traditional sustainable agriculture for quite some time now, and it is a beautiful 1100 acres of Tuscany. I continue to visit Spannocchia each year. The rest of the world may change, but things stay very much the same there, and that’s how it should be. During the summer of 2009 I wrote about 300 pages in my three weeks there. I began my project by laying out everything I loved about poetry and writing. I had just graduated with my MFA and felt obliged to iron out a sturdier sense of where I needed to go. The project took on other dimensions and became the foundation for what we do at the retreats. I now work to facilitate similar positive experiences for others. One issue that surfaced during this session of writing was something I see as a fundamental issue of our time, which I would call the need to feel fulfilled. For those lucky enough to have issues with fulfillment, the answer has to do with connecting with your inmost nature and giving your unique gift to the world. The art of fulfillment isn’t always functional in the sense that a toaster or a Ducati is functional, it isn’t utilitarian, and so we forget that it has an essential place. I wanted to bring people on a retreat to places very capable of encouraging the spirit of self-development in a primarily artful way. Being in a peaceful, richly enlivening environment where people can truly dedicate themselves to their health and their writing and obtain valuable feedback and guidance is a rare opportunity. I believe writing is a means of living more fully. Even if people don’t consider themselves writers, writing can be powerfully beneficial in the form of serious goal writing or self-reflective writing. Putting pen to paper tends to steady our attention, it helps us commit to things because they’re in writing, and it helps achieve clarity because things aren’t floating around in your head. It is one of the best ways for many people to start out on new paths. So much is just there with rhythm of thought and feeling that what needs to come tends to come. Sometimes it takes a kind of ritual re-elaboration, but writing does help bring it out, and once it’s there, the revelation can stick, because you can return to it by reading it. For me writing is much less about books and right words. Poetry is about paying attention, making decisions, and navigating language through meaning into song. I believe that the right words come to you with practice, belief and time, and by becoming intimately familiar with syntax. This practice carries over into the rest of life and helps grow focus and attention, which in turn does everything for connecting with a person’s truest nature and deepest gift and therefore their desire to teach or perform artfully. Simply paying attention is everything. What we give our focus to becomes the reality that we experience. Because of this, we need constant reminders to let us know that life is good and full of love and beauty. Even if you aren’t writing at all, you’re feeling through things into the deepest wonder you can perceive, but it is wonderful to have the writing there as a record of an artfully opening experience. Tell us about your writing guides—you wrote a book about writing Haikus, for example. In general, I feel that creative people are well-equipped to live a satisfying life simply because by definition creative people think differently, and many of life's challenges can be overcome (at least in part) by changing the way you think about them. The image of a happy creative person isn't the typical picture we get—more often, we imagine the struggling artist or the starving artist, but a creative person's artistic practice is one that challenges and opens them to live more fully. I believe people should take up the practice of haiku writing, because when they do, they deepen their experience even with ordinary events. I have spent years researching, teaching and writing haiku, and this guide contains the most important, most helpful information based on my experience. I want to give this information to other writers because it can be of great use to them. How has being a teacher changed the way you approach your own writing? I think for me it has mostly worked the other way around and writing informs what I teach. It is important for writers to have fun, take risks and I try to teach that. Being mindful of the play of apparent opposites through dialectic is a good exercise for most writers. Teaching is one of the best things in the world, and I take the responsibility of being a teacher very seriously. You encourage your Wellness/Writing retreat students to think of both conceptual and concrete best-case scenarios for each day. What’s an ideal day like for you? On my ideal day, I wake early in a place of natural beauty and go for a run/hike through the woods then return to spend the rest of the morning in solitude, writing in a room with an open window. During lunch I connect with friends, then spend the afternoon in good company, teaching, reading and learning. Evening is devoted to my wife Jade. Variety is important to me. I love travel – planes and trains--the simple act of being in transit carries over metaphorically as a call of action for being attentive. Things pass. What are some of your favorite writing exercises? One favorite is the 24-hour writing marathon. Another is the haiku writing exercise I go in-depth with during our retreats, and I also really love the find your deepest passion exercise. Mostly, I enjoy working on large projects, bit by bit, because any piece to a large puzzle has total freedom and play. I have fun seeing how things can connect. Your poetry draws strength and specificity from the natural world. How do you maintain the “ordinary awareness” you need to connect with nature in this way? Any time a human being spends in nature is infinitely rewarding. When we allow ourselves to feel natural we open ourselves with the full spectrum of who we are. I no longer sit and meditate daily. I basically work to mediate my attention as much as possible—via physiology, internal dialogue, and choice of focus, working to feel through each moment a deep expression of love’s opening. I believe in the relation to nature that indigenous people have and the relation between self and other that points to a clear, loving, conscious oneness. Being in natural surroundings helps facilitate most any kind of positive growth. The way we relate with our environment bespeaks our internal and interpersonal relations also. Feeling fulfilled or recognizing the present moment as perfectly sufficient is a matter of degree – and it’s an art. There’s really no worry; it’s primarily an issue of magnifying with presence the love, gratitude and compassion of what is already here with us. Many of your poems contain moments of quiet revelation—or transcendence, as you put it—a private smile from wife to husband, say. How much do you know about these revelations before you start writing? How much do you know about a poem before you start writing? About half of the time, I will experience something or will have an overall mood that might become a poem. Part of that depends on my skill at articulation and organization of a memory or feeling. The other half of the time, the poem’s experience emerges from the craft of it, from revisiting notes or re-envisioning a scene. A poem is a record of a pattern in the writer’s mind in relation to their experience. The work itself is a go-between for the reader and the experience, and the reader and the poet. Because of all this play that goes on, because time carries a song, writing is always a discovery process. It’s a matter of fully associating with a feeling. For example, almost exactly a year ago, due to uncertain causes, I nearly went blind in both eyes and required surgery and six weeks laying at a 45 degree angle on my left side. This sizable chunk of time has become in some ways a single experience to me because of how it felt. If I am reflecting on that, feeling grateful, and, as just happened, I walk outside in the night and happen in the streetlight to see a large owl pass overhead, something clues me in that there is a poem there. Elementally, I understand that it is a scene: there’s a tone and characters and action. Ultimately, though, what strikes me is that single moment of being, so if I were to write that poem, it would need to honor that. It isn’t impossible. The Haiku in English and Writing From Direct Observation are available on his website.